It occurred to me that a recommendation I read in a commentary shortly after the recent murders by Islamic extremists in Paris may also be applicable to other groups who feel under siege. This could include guns rights activists and ethnic groups here in the United States including blacks and Hispanic and others fearful of losing rights or being profiled and stereotyped because of the actions of a few. Dr. H.A. Hellyer points out that it isn’t enough for Muslins to condemn terrorism or to lay down their lives fighting extremist. What is really needed, he suggests, is a strengthening of internal “counter narratives” within that religious culture including being more openly critical when there are abuses in Muslim states. No doubt that law enforcement agencies need to purge the small number in their midst who are racist including those who hide abuses of their authority behind a badge. Both police officers and protestors have valid points but the real solution for populations where the individuals feel unfairly criticized for the actions of a few is to admit there is some validity to other points of view and strengthen internal counter narratives. Master narratives often anchor group behavior and attempt to purge outliers for “airing dirty laundry” on the premise that there is only one issue and one solution and admitting otherwise will bring disgrace. Groups caught up in master narratives lose sympathy this way, even though internally they exhibit a far wider range of opinions. Mormons, for example, were always divided about the practice of polygamy which before its ban by church leaders in 1890 was practiced by 20-30% of its members, most as a “calling” from local officials. To have acknowledged the internal tension, which had been expressed since the mid-1830s, was considered off limits because it would show lack of solidarity, undermine authority and strengthen those who persecuted members. The same could be said of blacks as a group since the mid-1960s who worry internally about self-inflicted problems but rarely admit them, other than to friends, for fear these more complicated concerns would undermine the master narrative of discrimination and victimization. Occasionally, individuals and groups within that race, have spoken out, such as Dr. Shelby Steele who in 1990 authored a book entitled The Content of Our Character: A New Vision of Race In America. He was roundly criticized by black leaders fearful that acknowledging the role of rearing and personal and neighborhood responsibility would dilute the master narrative, although many blacks agreed with him in private and began marches to that end. Hispanics often do the same regarding illegal immigration or Hispanic gangs. And the NRA and other gun rights groups have taken the master narrative to a new level. But quietly or periodically condemning certain behaviors while insisting the problem is externally imposed never really works. Counter narratives also don’t require airing “dirty laundry,” so to speak. Granted, with today’s news feeding frenzies, it is hard for groups to hear themselves think and openly discussing shared responsibility when anecdotal news turns agenda-like, focused only, it seems, on “he said-she said” dialogue which quickly forces binary conclusions. Really? Refused? Or maybe their conclusion after seeing all of the evidence was just not convenient to some people’s master narrative. 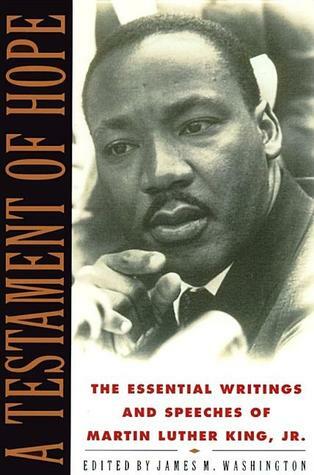 One of the books I’ve mentioned reading for a few minutes each morning to get centered is A Testament of Hope: The Essential Writings and Speeches of Martin Luther King, Jr.
You can’t turn a page without reading a counter narrative. If he were alive, I believe he may have joined the recent protests but he would have also pointedly shed light on the responsibilities on both sides of the tragedies and directed attention not just to institutional change but individual, family, neighborhood and community behavior. In doing so, he gradually enlisted support from unlikely groups that he would have alienated with only the master narrative. Newtown, Ferguson, Staten Island and Paris deserve more.